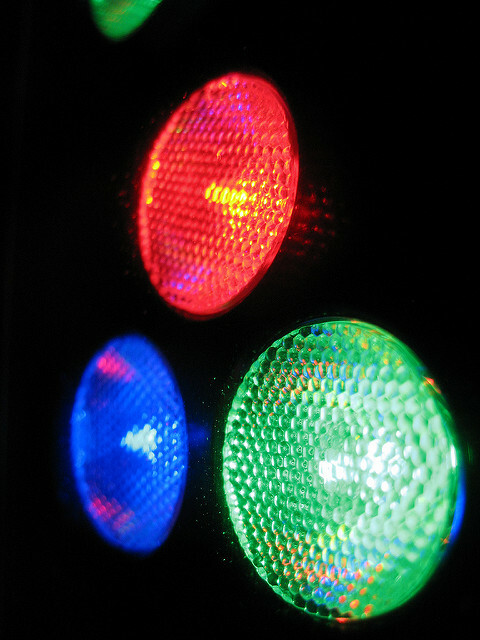 The continued growth in the use of colour-mixing LED based stage lighting fixtures leads to some unique control requirements. On Stage Lighting give you the quick information on “Virtual Dimmer”. And not before time. This brief guide to Virtual Dimmer spawned from a sudden realisation that there isn’t really any such help here at On Stage Lighting when it comes to a concept that is now really common in modern lighting control. What is a Virtual Dimmer? Not some ghostly flightcase buzzing away back stage, Virtual Dimmer is the common name for a stage lighting control concept that exists in pretty much all professional grade lighting controllers, Its use relates to the control of colour mixing fixtures that don’t have a dedicated DMX channel for Intensity (or, ‘Dimmer’) – commonly ones based on multicolours of LEDs. Why do we need Virtual Dimmer? Depending on the fixture, some DMX modes on these PARs will also contain another channel which controls overall Intensity, what we might call the Dimmer channel. But using only the basic modes above, we have no easy way of controlling the overall intensity and have to make do with adjusting the individual colour channels to alter the brightness – with a risk of changing the desired colour. Not only that, but with no dedicated Intensity channel our lighting console has nothing to apply Dimmer FX to which reduces the options for the fast creation of brightness dynamics using the effects engine. This is where Virtual Dimmer comes in. Having patched our example 3 channel RGB LED PAR to the controller, we can also assign it a Virtual Dimmer. This isn’t another DMX channel, in fact no extra DMX channels are sent from the desk. Instead, the Virtual Dimmer is a concept that lives inside the console software and makes sure that the fixtures behave as if they have their own Intensity channel that controls the overall brightness and can take console generated dimmer FX. When would I use Virtual Dimmer? You are using LED colour mixing kit that only has simple RGB or RGBA modes with no mode containing a Dimmer/ Intensity channel. You want to run your fixtures in the simplest mode possible, maybe to save DMX channels on a universe or just because it is easier at that moment. You have a multi-channel fixture which you don’t have time to mess about working out a personality for and so choose a simple generic fixture file that will control the first few channels as RGB and you ignore the rest. (Note: don’t forget to leave gaps in your DMX start address allocation for all the other unused channels). You are using a fixture that has a silly Intensity channel, such as values of 0 – 127 = 0% to 100%, with higher values on that channel being something annoying like strobe or macros. One solution is to ignore the Intensity channel completely and use Virtual Dimmer instead. Each console type has its own particular method for applying a Vdim, and as usual the User Manual is your friend here. Main thing is to do it at the patching stage before any serious programming has happened. Alternatively, if you have done a lot of programming without any Intensity information and only have RGB data in the cues then suddenly applying a Vdim isn’t going to make much difference to the programming you have already done. However, if all this is happening as part of a Morphing action (where you change the fixture type on a console that has already been programmed), then you may need to go back and tidy up the programming to include the Vdim. At the very least, you’ll need to remember that the level of the Vdim will need to not be at 0% for any of your previously recorded looks to be seen on stage. If you spend any time working with lots of different LED kit, pixel mapping of LED arrays or even just own some really cheap and basic LED PARs you can be sure you’ll end up using Virtual Dimmer as a solution. Do you use Vdim for particular situations? Let us know in the comments below as usual. I have been trying to set up 3 circuits of cyc lights (i.e. 3 dimmer channels) as a single 3 parameter instrument with a virtual dimmer to control the overall output. But I didn’t get it to work before I ran out of time. Has anybody tried this and had any success with it? Did you use a 3 channel RGB generic HTP fixture profile? Reckon that’d work. Thanks for the info. Well explained.